Yes. Your favorite grocery store that cuts you grocery bill in half is my new favorite spot for body products. Seriously. Get ready in the next few weeks for me to roll out my favorites, starting with this body lotion. Every time I go into Trader Joe’s and pass the beauty section my girlfriend has to pull me away. I’ll wonder off and she always knows to find me in front of the lotions and potions. She always tells me I need nothing, this is completely true, I basically live in a beauty supply store. 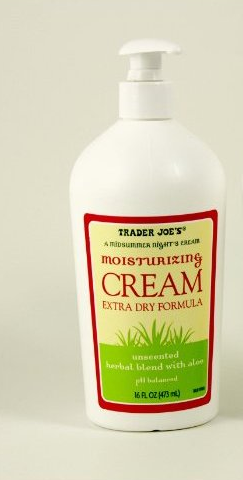 Anyway, last week I went to Trader Joe’s alone and picked up this body lotion, you know the lotion they keep by the register. So, while I got to Trader Joe’s in NYC, anyone who lives in NYC will tell you battling the crowds at Trader Joe’s takes skill so I avoid it and go to other grocery stores. But in Chicago, there are no crowds its peaceful and the best part is that at the registers they have hand sanitizer and lotion, this lotion. You see my girlfriend does this thing every time she checks out, this thing she does is hand sanitizing and lotioning, a nice refresh after touching tons of grocery store surfaces. This is when I fell in love with this lotion– it is my favorite! No scent, thick like frosting, absorbs fast and really truly moisturizes. It may be Spring, but my skin is still acting like its winter and this lotion is perfection, I’m completely obsessed and so happy I don’t have to wait till I grocery shop to slather it on. Oh did I mention its less than $5 bucks– seriously try not to get one for every spot in your life. Thank me later, this stuff is really a gem.